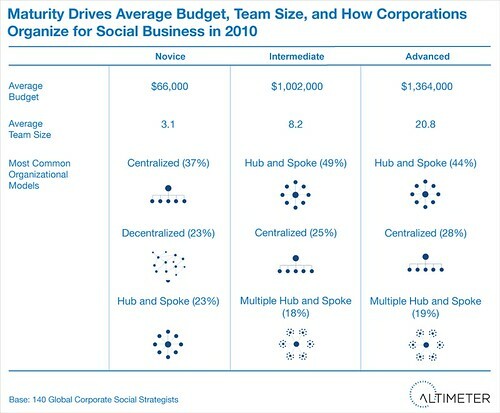 Like all other Investing, Invest in Social Business based on Market Research. Just as you would invest in your personal finances based on your family size, age, and market conditions you should be spending in social business with the same industry knowledge. 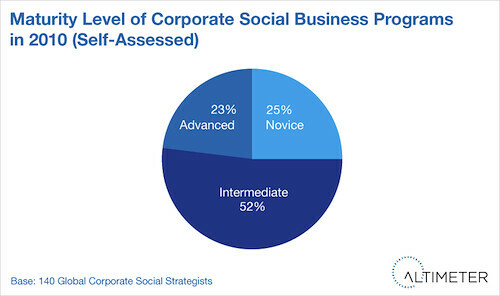 With limited budgets, the corporate Social Strategist (read report) faces a spending dilemma. 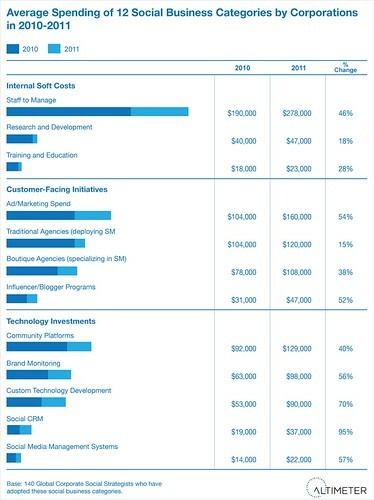 In 2010, the average annual social business budget at enterprise-class corporations was a mere $833,000. 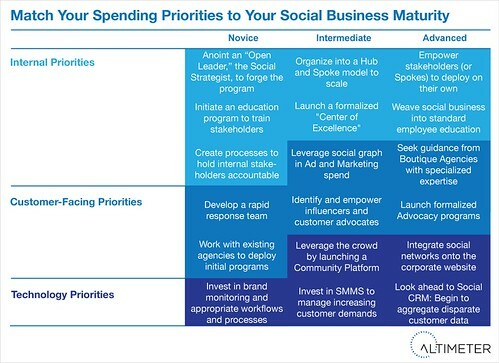 Now, Altimeter Group is publishing spending and deal size averages based on social business maturity for corporations to finally benchmark and cross-check their own spending efforts. Adjust investments: Cross match how others are spending in your same maturity level, as well as the next phase in maturity for your program forecast. Share report widely with vendors, agencies, and internal staff. Use this data to both fuel your own internal budgets, but also bring this guide in all your agency and vendor introductory meetings, so they know you are in the know how spending is happening based on maturity. Send this report to your agency partners, software vendors, and consulting teams so they can understand the trends in spending and ensure that they will support your mission based on your existing maturity. The more you spread it, the easier it is for me to produce more reports. This research was 100% funded by Altimeter Group, and we are releasing it under Creative Commons so you can use it in your planning, presentations, and blog posts. You can download the report directly from Slideshare, and use the images provided below for your slides. I’ve embedded sharing buttons on the upper right side of this post, for your convenience. Lastly, I’d like to recognize Altimeter’s research team, Charlene Li, Christine Tran, and Andrew Jones for their assistance on this research report. I’ll cross post to those that add to the discussion, and will be active in the discussion in the comments below.